Some believe that stones and trees hold on to the memories of a place. I believe that’s true. The stones in Glasnevin Cemetery in Dublin go on forever. 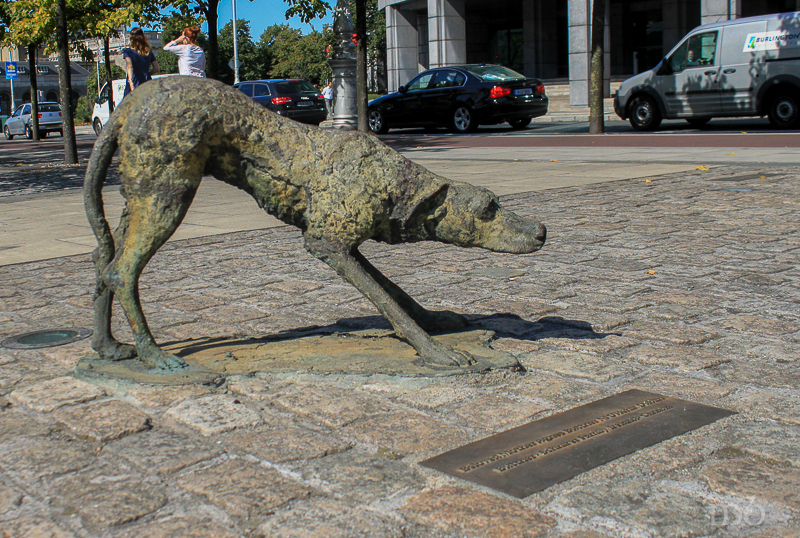 Over 1.5 million people have been buried there since its establishment in 1832, and the markers tell the story of Irish. I went to Glasnevin for those stories. I stayed and was overcome by the art and power of the stones. Here is a short video featuring some of these remarkable stones. 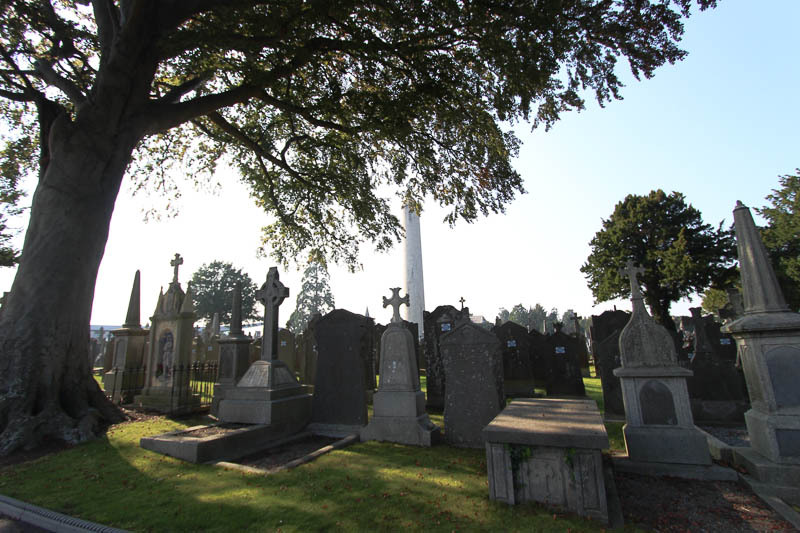 Glasnevin was established after Daniel O’Connell got legislation passed that allowed Catholics to practice their burial rites and traditions in public. Prior to this, Catholics were oppressed and the “penal laws” prohibited them from the public practice of religious ritual. 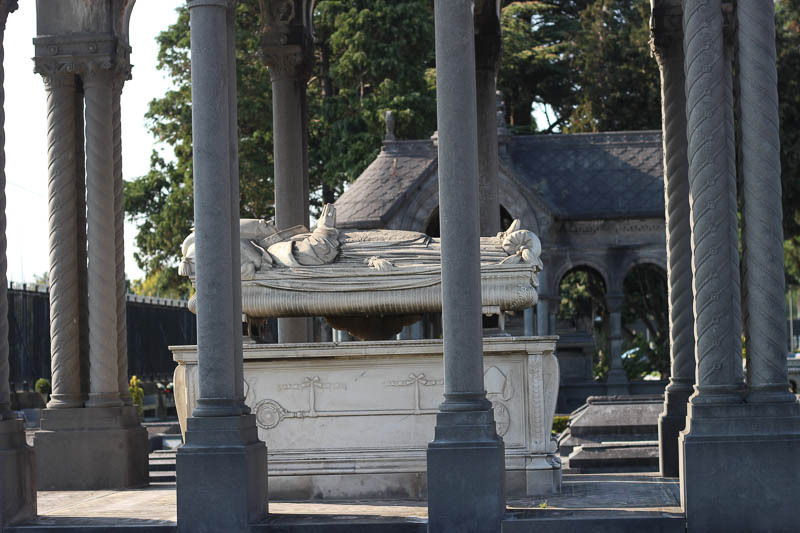 At Glasnevin, Protestants and Catholics were buried in one place. There was even a place for stillborn children, or children who died before being baptized. When I planned my trip to Glasnevin, I intended to see the graves of Michael Collins, Eamon de Valera, Brendan Behan, Maud Gonne and Constance Markievicz. My friend Kathy and I spent hours there … not looking for certain graves, but simply looking at grave after grave, stone after stone. The craftsmanship and art in preserving memories and marking places of importance is overwhelming. One loses track of time. Glasnevin is a thin place. 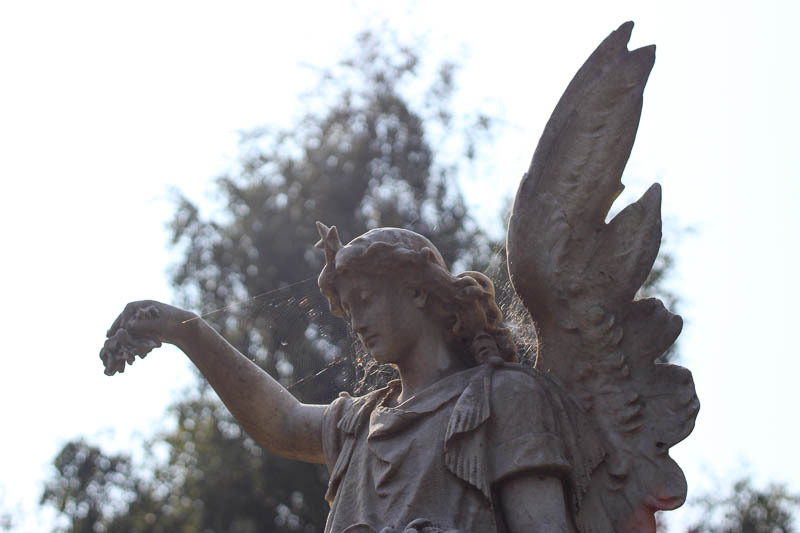 If you plan a visit to Glasnevin, be prepared to walk and give yourself enough time to wander, to think, to get inside the memories that marked here in gardens of stone that go on forever. 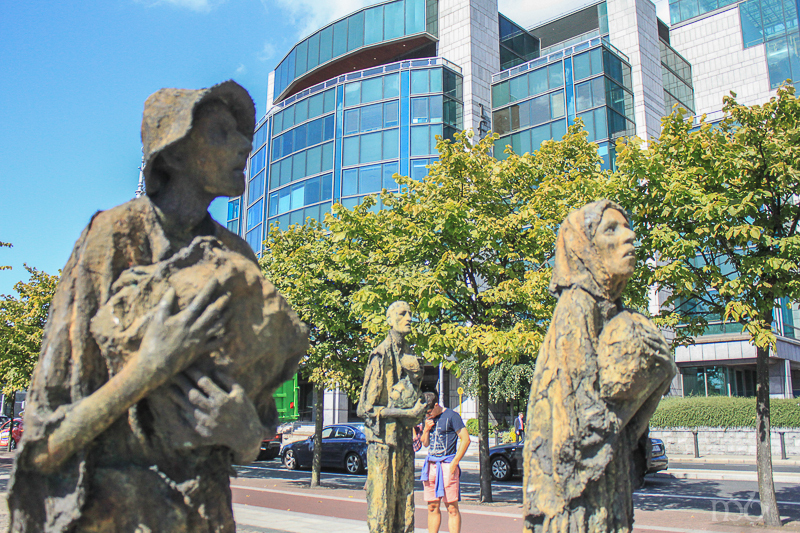 What to see in Dublin – Ireland’s biggest City? We start almost all of our Thin Places mystical tours in Dublin because that’s where the airport is located. But how to choose what to see in Dublin? But being a bustling international City, Dublin doesn’t seem like a place one would find sites of high energy vibration or a sense of walking in two worlds. But since almost all international tourists enter the country through this city it’s worthwhile to mention some sites worth seeing. 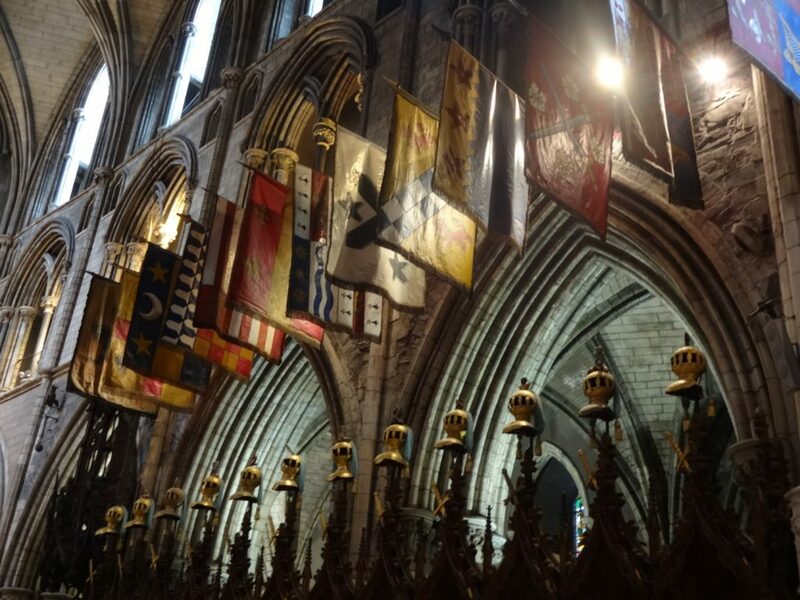 Certainly among those would be the two Cathedrals south of the River Liffey – Christ Church Cathedral and St. Patrick’s Cathedral. There are many thin places in Dublin. Ancient Holy Wells of Dublin by Gary Branigan proves that holy sites are in your midst even on the busiest of streets, and Gary has identified about a half dozen right in the City Centre. Most thin places I’ve sensed in Dublin are closely related to the arts. If being in a thin place inspires artists to create and draw on other-worldly energy, then that thin-place energy that inspired them lives in the art. The art itself radiates the energy and connects with those who take the time to let it soak in. 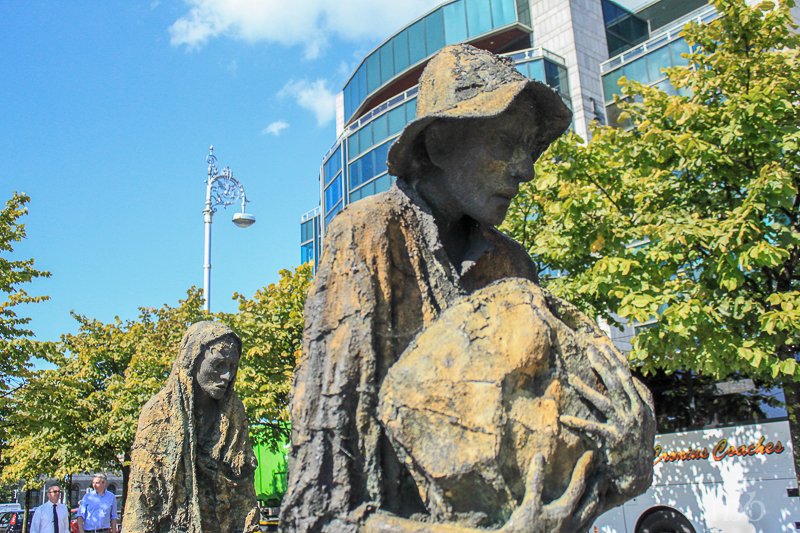 One need only to visit the Famine Memorial along the Quay or the Garden of Remembrance in Parnell Square to connect with such energy. Both are within a mile of each other in the City Centre. But a sweet cluster of thin places are scattered around Parnell Square, named for Charles Stewart Parnell. On the south / east corner where O’Connell Street links with the square are some interesting Georgian houses, with the Gate Theater, anchoring the corner. Actors like Michael Gambon, James Mason and Orson Wells go their start at the Gate. 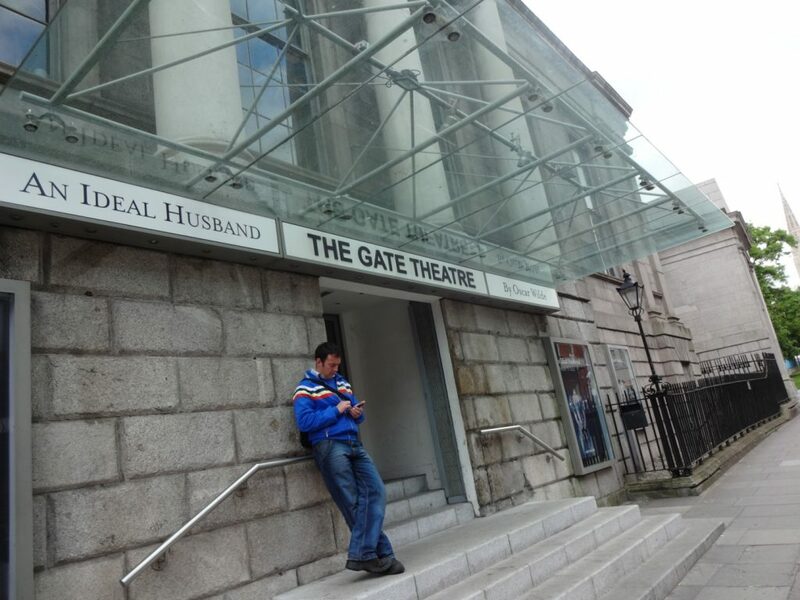 It’s known for its productions of works by Irish playwrights including Samuel Beckett and Oscar Wilde. 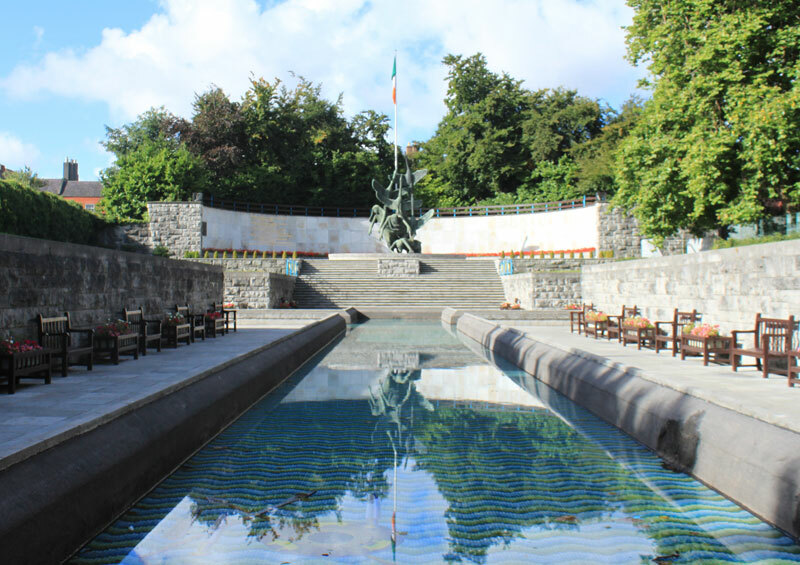 Just up from the Gate Theater is the Garden of Remembrance, one of the most inspiring sites in all of Ireland. Across from the Garden of Remembrance on the north side is the Dublin Writers Musuem. 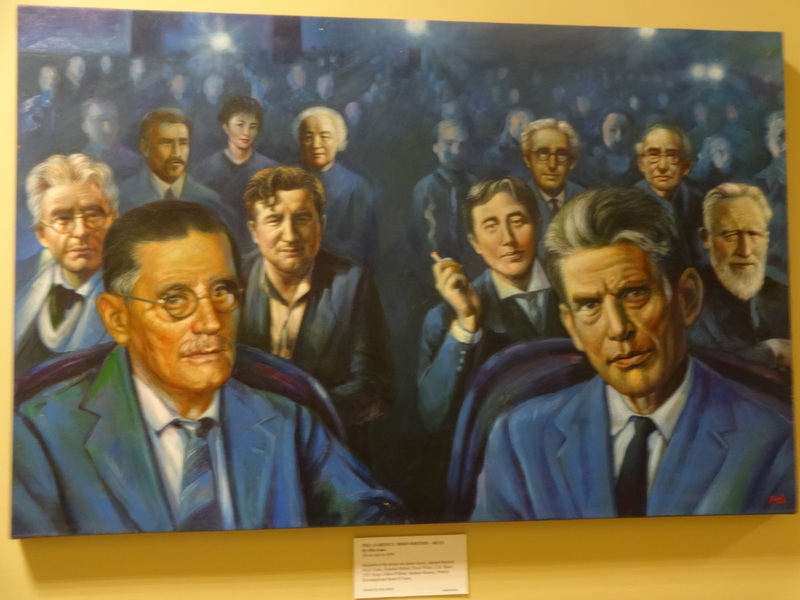 It’s an excellent tribute to Ireland’s literary greats from Johnathan Swift to Brendan Behan. 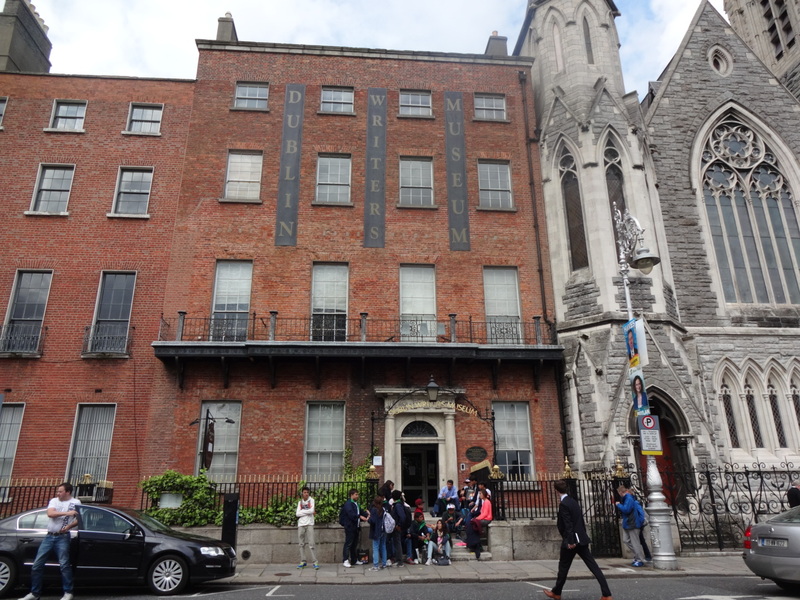 There’s numerous letters, books, and artifacts from some of the greatest writers in literary history such as like William Butler Yeats, George Bernard Shaw, Sean O’Casey, Oscar Wilde, Samuel Beckett and James Joyce. Some interesting personal items include Brendan Behan’s union card and typewriter, letters written by W.B. Yeats and a first edition of Bram Stoker’s Dracula. There are dozens of personal items carefully preserved and displayed. The Hugh Lane Gallery is also on the north side of the square, was the first public gallery of modern art in the world. It houses a great collection of Francis Bacon’s work. When Bacon’s heirs donated the entire contents of his studio in England to the gallery, careful attention was paid to recreate the studio in the Lane Gallery to closely resemble the original studio. 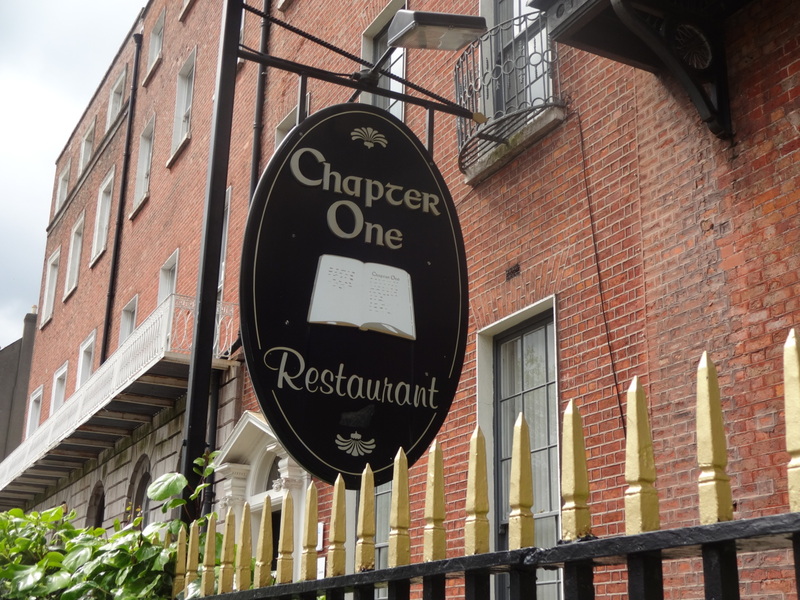 Chapter One Restaurant situated between the Irish Writers Museum and the Hugh Lane Gallery is one of ten Michelin star restaurants in all of Ireland (2013), a mark of excellence in cuisine and service. The owners take pride in using local artisans and food producers. They believe that drawing on local talent in the way of food growing and producing is what sets them apart from other dining venues and creates opportunities for growth. 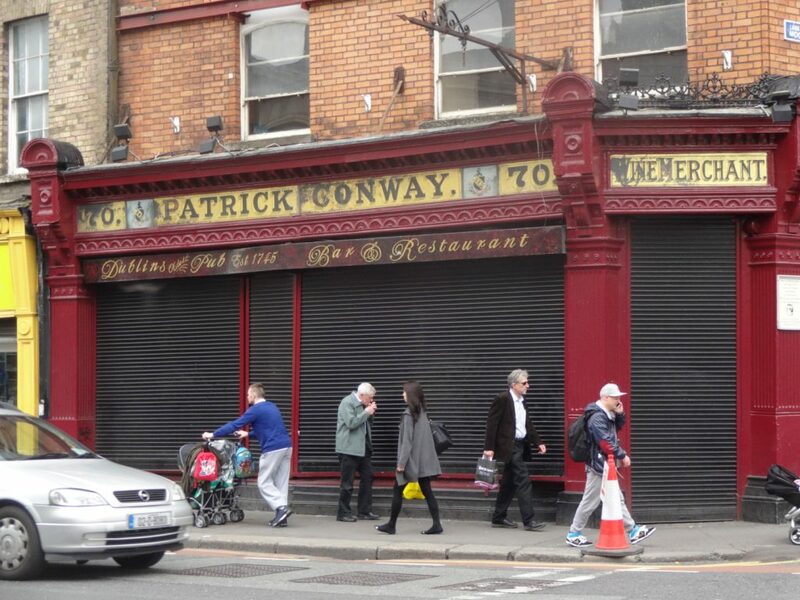 On the south side is the now shuttered Patrick Conway’s Pub, the oldest pub on Dublin’s north side. This is where Pádraic Pearse surrendered to the British after the Easter Rising failed in 1916 – which is so noted by a plaque on the outside wall. 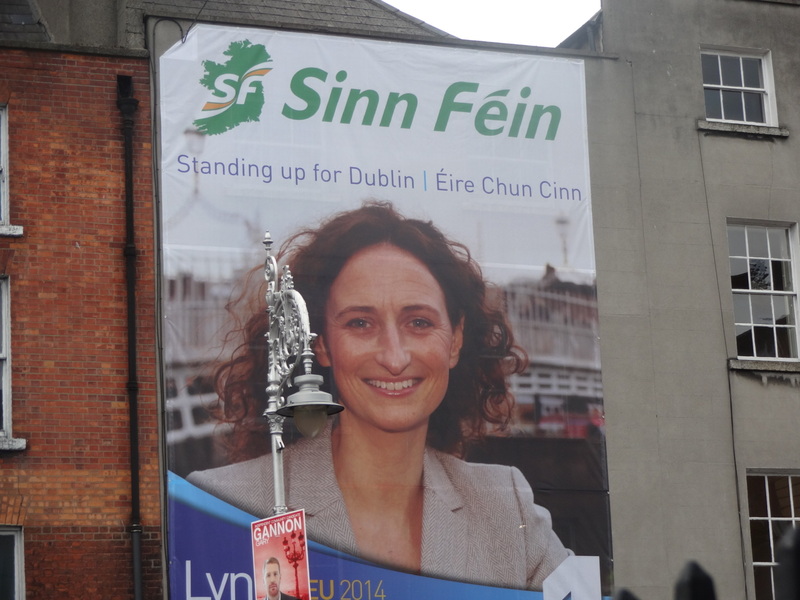 And as if echoing that association with Irish patriots, the Sinn Fein Dublin office and shop is catty corner to Conway’s pub. 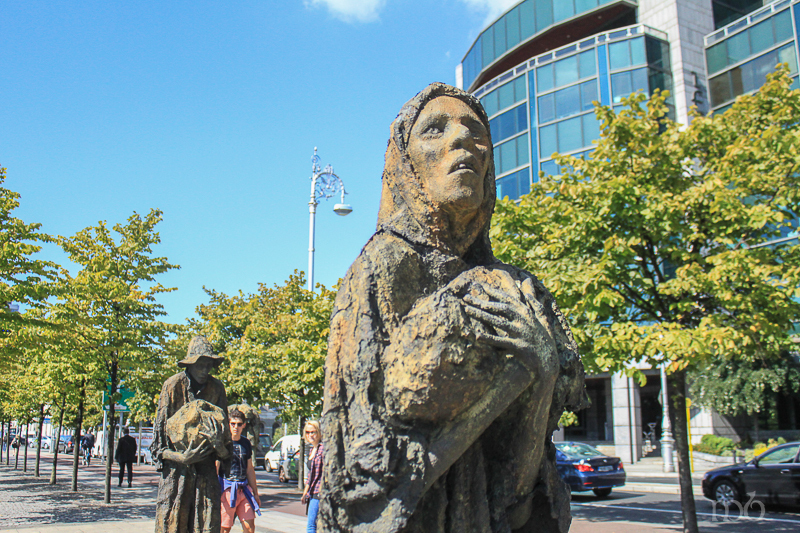 Dublin is full of art, from the statues of Irish heroes on O’Connell Street to the Cathedrals (St. Patrick’s and Christ Church) to the roadside devotional statues to saints, the Blessed Virgin and Jesus. There’s much to enjoy about the city that connects with the desire for thin places. 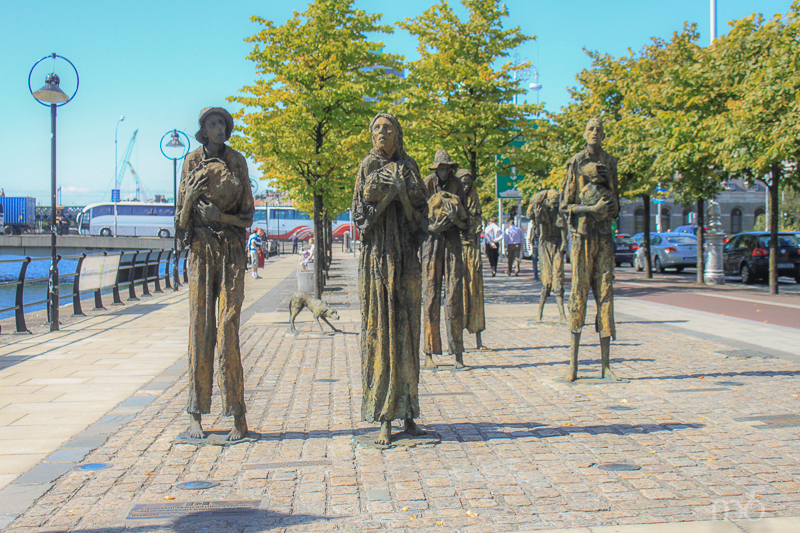 Of all the Famine Memorials I’ve seen in Ireland, the one in Custom House Quay in Dublin’s Docklands is the most moving. 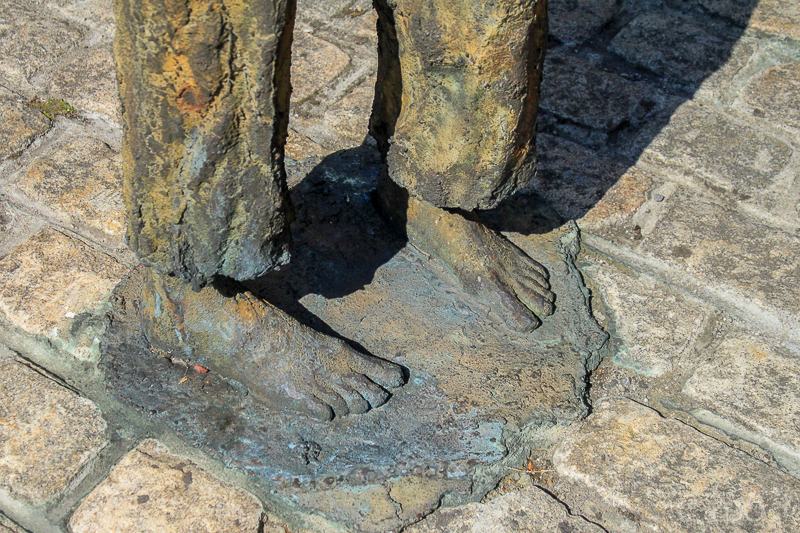 Life-size sculptures of gaunt, listless peasants stand almost as if in slow motion … wandering down the quay. If ever there was a depiction of “walking in two worlds” it here. One world reflects the current pulse of Dublin. Business people, tourists, and cyclists move along this path on the north side of the River Liffey at a quick pace. Their intent is focused. Even those sitting on benches are texting, or chatting on the phone, or reading. 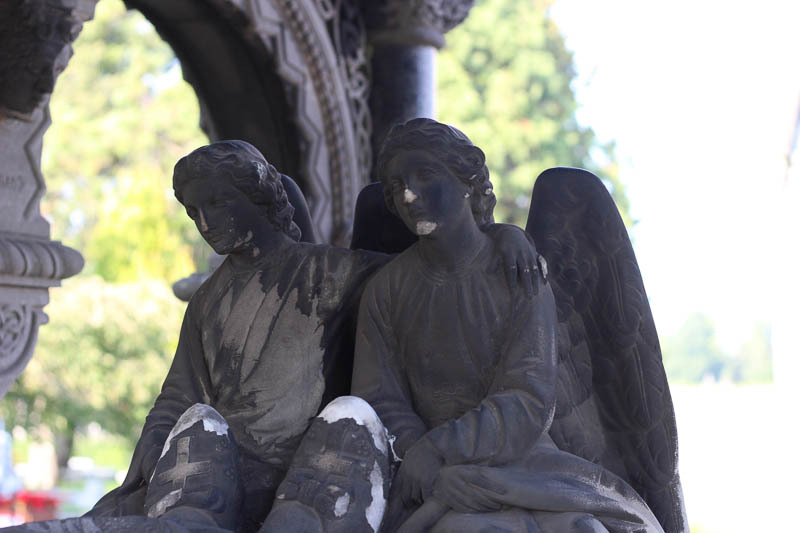 Few take notice the bronze faces and bodies – frozen in place. The Other world is the world of the famine walkers. The world of 1845 when Great Hunger began. 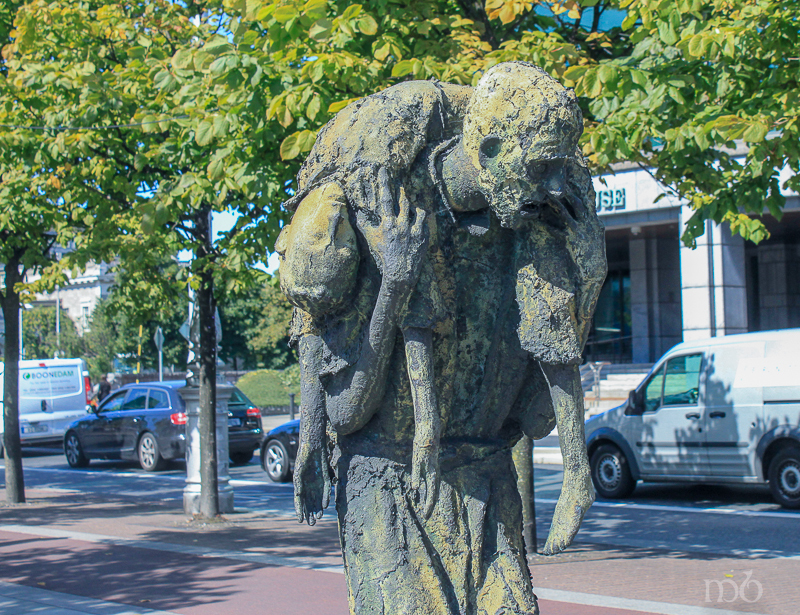 The walkers move quietly through the chaos of busy Dublin, slowly and deliberately. They plead for help, for food, for shelter from those who have plenty, but are are turned away or ignored…. treat like bothersome pests. They begged the world to notice them then. They beg the world to notice them now. When the world looked away, they lost their homes, their children died, their families crumbled. They starved. Now they are a memory that moves through the veil of time onto Custom House Quay so that we who have much, might be moved. One of the first Famine voyages carrying the starving Irish to new lives in America left from the this place. The ship was named Perseverance. It sailed on St. Patrick’s Day in 1846 and landed in New York two months later. 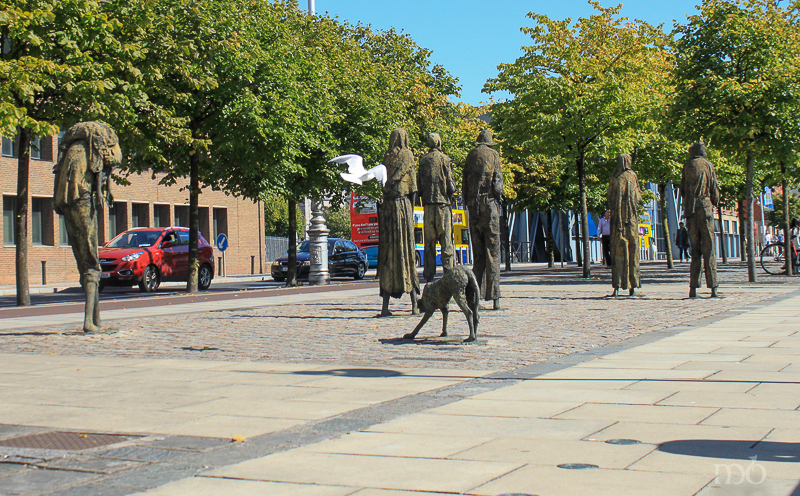 The bronze figures were designed and crafted by Dublin sculptor Rowan Gillespie, and they were presented to to the City of Dublin in 1997. 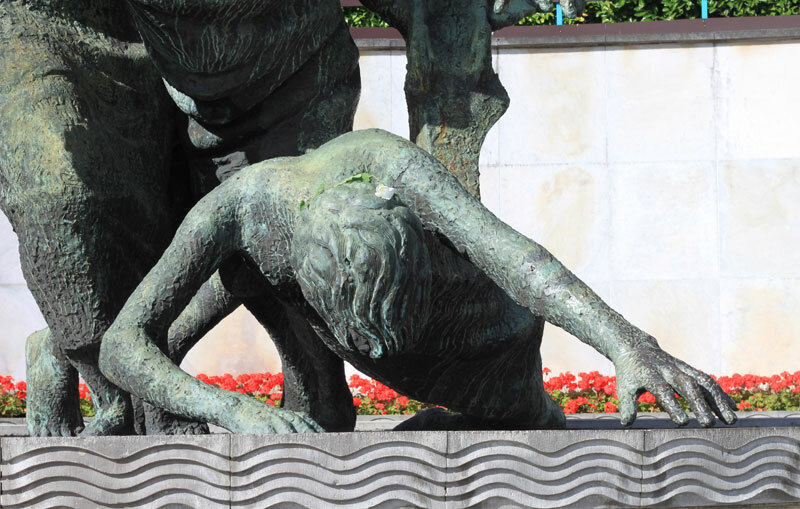 Our guests on Thin Places tours in 2014 will visit this Memorial and a few others in Dublin. Lir was the Lord of the Sea, in the days of the Tuatha de Danann. He had four children – a daughter, Fionnualla and three sons – Aodh and twins Conn and Fiachra. His wife died when the children were still young and Lir married Aoife a woman with magical powers. Aoife became jealous of the love Lir had for his children and they for him. She also resented how much the children missed their mother. She tried in vain to get a servant to kill the children, thenclost her nerve when she herself set out to kill the children. So she cast a spell on them. She turned the children into the most beautiful swans ever seen, and told them they would be forced to spend nine hundred years as swans – three hundred on Lough Derravaragh, three hundred on the Straits of Moyle and three hundred on the Isle of Inish Glora. They would, however be allowed to keep their voices and as swans they made the most mystical, magical music in all of Ireland. To end the spell the children would have to hear the bell of the new God, and a holy man would have to ring it. For three hundred years they lived on Lake Derravaragh and then they flew to the Straits of Moyle and spent another three hundred years. By this time, St. Patrick was converting all of Ireland, and Ireland had accepted this one true God above all gods. When the last three hundred years of exile on the Isle of Inish Glora were up, they met a man named Mochua. They asked him if he was a holy man and he said he was. He asked them if they were the children of Lir. He had heard about these beautiful swans who sang magically being the cursed children of Lir. 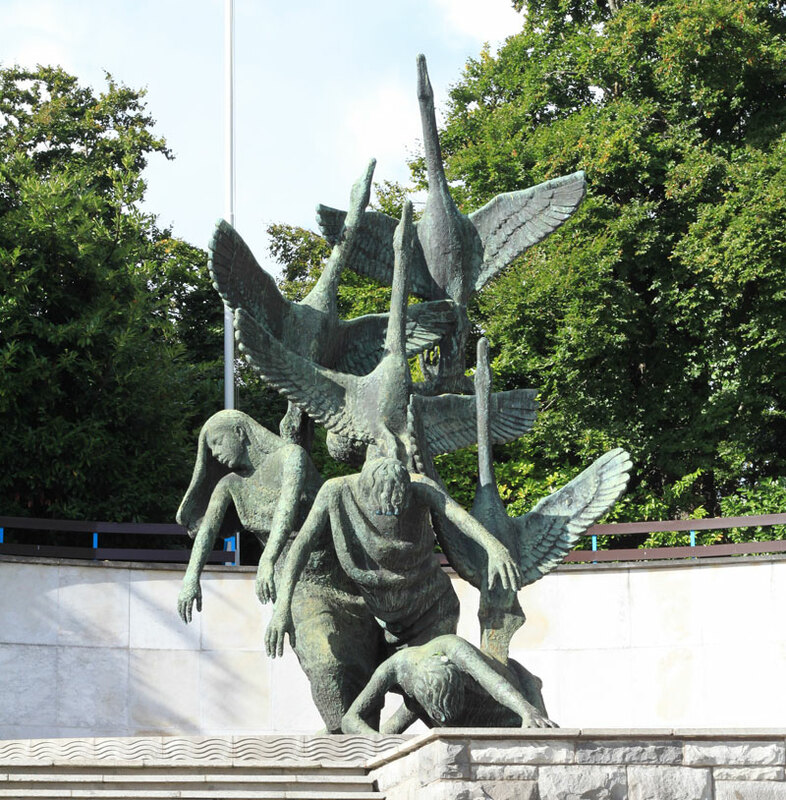 They responded that they, in fact were the children of Lir. Mochua set about to make a bell to ring to set the children free. Just when the bell was finished, the King of Connaught came to the Isle of Inish Glora demanding to take the swans to his castle because his wife was captivated by their beautiful singing and wanted to own them so she could hear that singing whenever she liked. The King was prepared to take them by force if necessary. Just as he began to round up the swans, Mochua rang the bell with fierce enthusiasm. A mist formed around the swans and a great white light seemed to illuminate them suspending them in the air. The swans began to rise and then fade, and below them the limp forms of four children appeared on the ground. 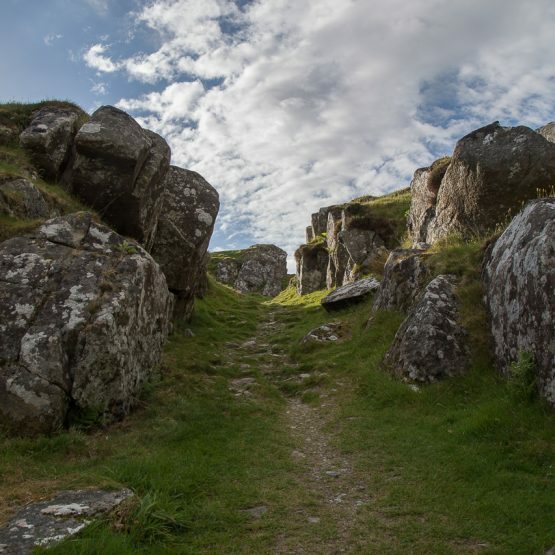 The human bodies of Fionnualla, Aodh, Fiachra and Conn aged 900 years in a few minutes… and they died, ending the race of the Tuatha de Danann. 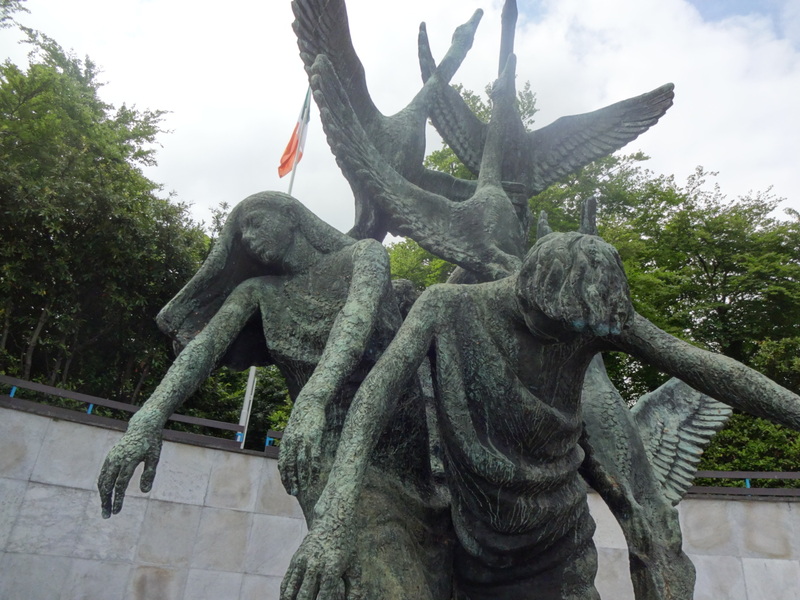 The spirits of the children of Lir were united with their beloved parents and their presence is felt today by those who choose to remember them. 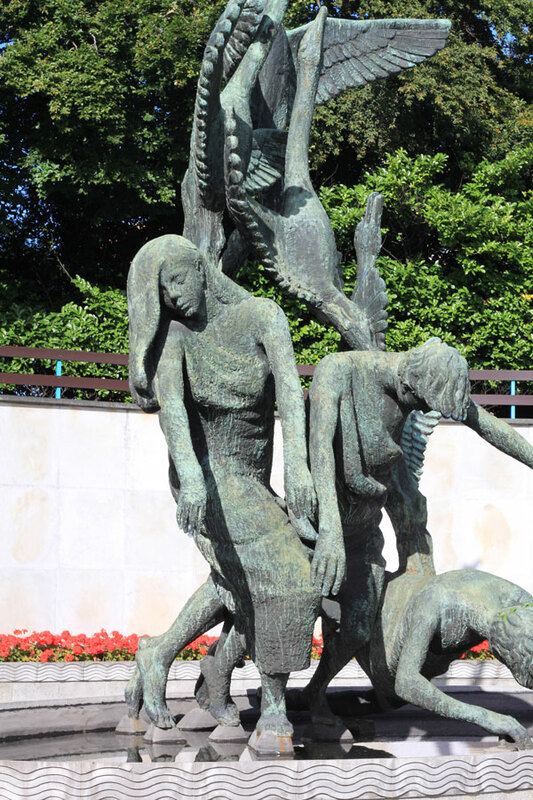 The Garden of Remembrance in Dublin was built in memory of all those who gave their lives fighting in the cause for Irish freedom. 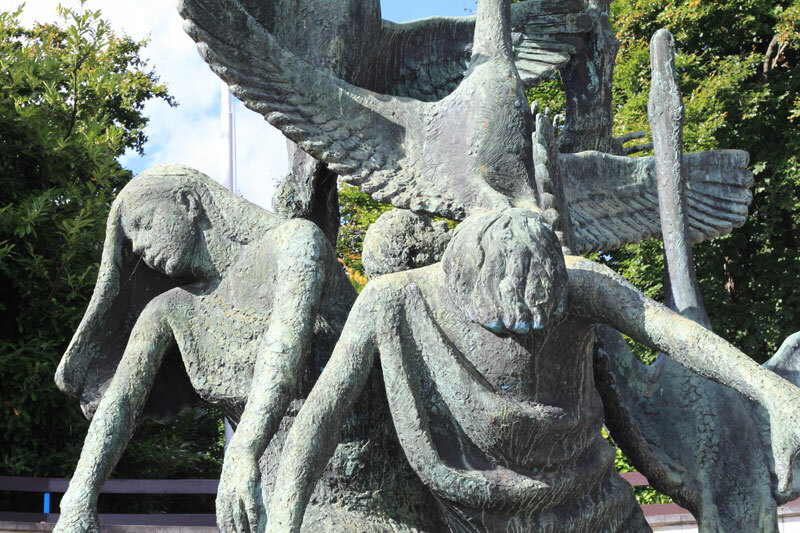 The memorial is built on the site where leaders of the 1916 Easter Uprising were held overnight before they were taken to the Kilmainham Gaol to be executed. 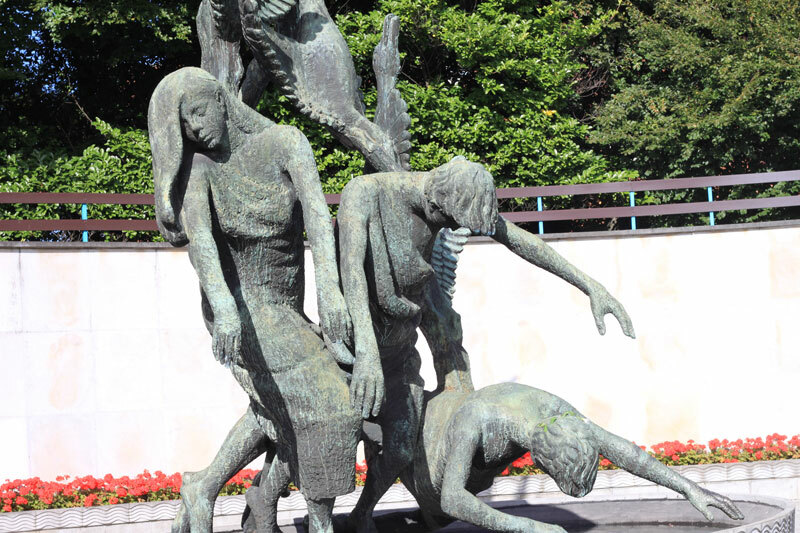 The dominant feature in the garden is a sculpture representing the Children of Lir who had to live in exile for 900 years, similar to the 900 years of oppression the Irish suffered under British occupation. 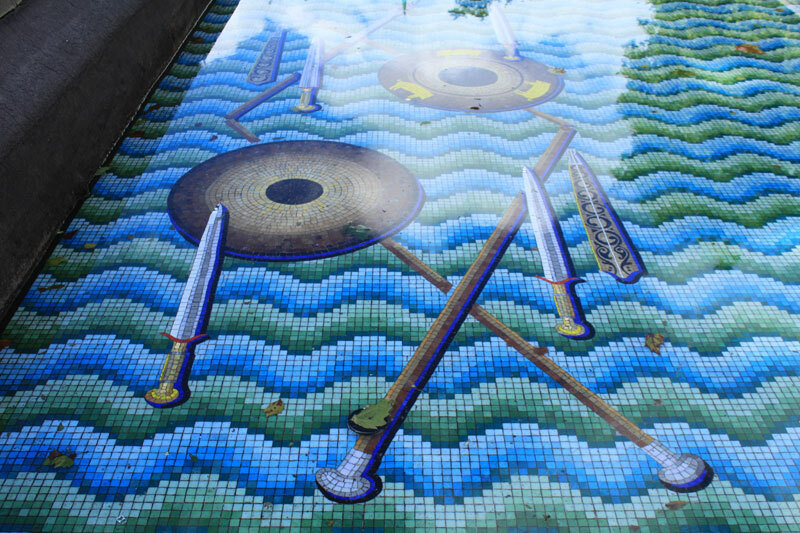 A reflecting pool has images of swords, spears, shields an implements of warfare painted on the bottom. In the Celtic tradition clans who did battle cast their weapons into the sea or a lake after the battle is over to symbolize the end of hostilities. The Garden of Remembrance is a thin place.